It's winter. That is, unless you leave below the equator. For those using computers and shivering, the wizards at Japanese peripheral company Thanko have a ridiculous mouse pad for you. WITH VOLTRON EYES. 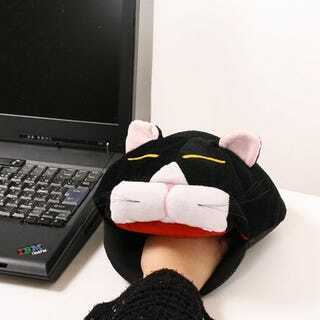 It's a cat mouse pad that has a USB powered heater in it, which should keep your mitts nice and toasty throughout these bitterly cold winter months—or nice and sweaty if you're in South America right now.